In a world of super-fast broadband internet, analogue radio may seem like an old-fashioned way of getting a message across to hundreds of thousands of people. But when you're working in one of the poorest and most conflict-ridden parts of the world and the message centres on saving one of the world's most iconic animals from extinction, then the radio remains a key tool for conservationists. Taking advantage of the benefits that radio can bring as a strong and powerful channel for spreading news and information, Tuver Wundi is spearheading efforts to use it to promote the conservation of the gorilla. 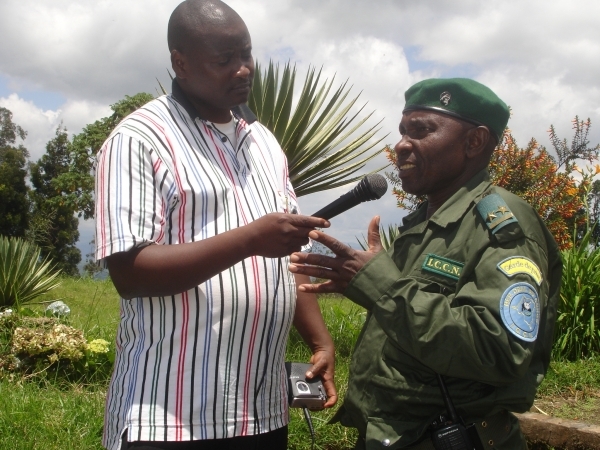 As a long-standing supporter of the great apes, he discovered that radio was the best way to create a special link with people living on the edge of the mountain gorilla habitat in DR Congo and also an effective way of giving them the right message about protecting the environment focusing on the conservation of gorillas. "It was in 1996, after realizing that people living around the protected areas were doing a lot of damage to the forest and the gorilla's habitat, that I decided to bring information via multi-media to them," says Wundi, who is based in the city of Goma, in the east of the country. Since 1998 he has been producing and presenting Radio Cosmos: Notre Monde a show that promotes the preservation of the gorilla. "The programme came about as an answer to filling the gap of information in the region concerning all types of conservation activity," he explains. "I was not only involved in the radio but also in the field via conferences, entertainment activities like football games, theatre, music and cinema to bring the message to people". 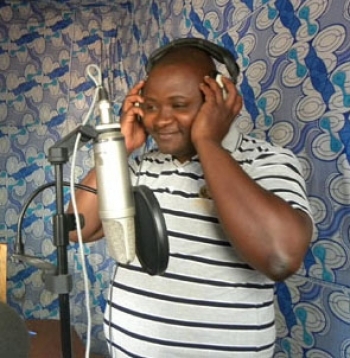 Every week, through DR Congo's national radio company, he talks about different topics. 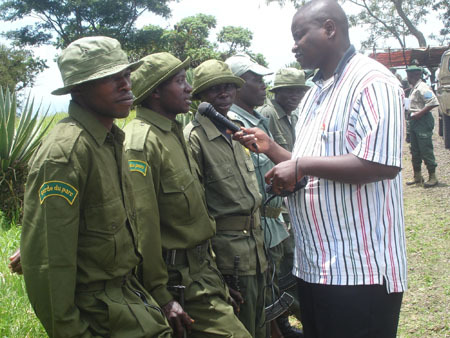 From environmental-related themes like deforestation, climate change to the activities of The Gorillas Organization, for whom he also serves as a communications specialist, and the conservation of national parks. Wundi also focuses on wider subjects such as the protection of the environment, the benefits that gorillas can bring to communities such as through wildlife tourism, the ways people can help institutions of conservation to save the last gorillas and how people can become friends of nature. "I enjoy changing peoples attitude to gorillas and conservation in general and I'm happy that my idea has helped to reduce ignorance about the protection of nature. There is still a long way to go, but we are contributing to the education of local communities and bringing a new approach to the interaction between the people and the protected areas", he adds. Again, conservationists are turning to radio as it remains one of the best means of reaching a large audience on a limited budget. Each week, some 500,000 people over an area of 100km2 tune in to listen to Radio Cosmos: Notre Monde: 500,000 listeners in an area of 100 km2. This show has now become one of the people's favourites in Congo and this summer Wundi himself was named as one of the best radio presenters in Africa while his programme for education by the Kivu Bussiness & Tours Agency. "This is recognition from people and organisations tasked with building a better country for the efforts we are making for conservation," he notes. "However, our radio show is still quite local. Hopefully we can go on to bring this important message to others across Africa, or even the wider world!" Original radio broadcast by Luis Dominguez.